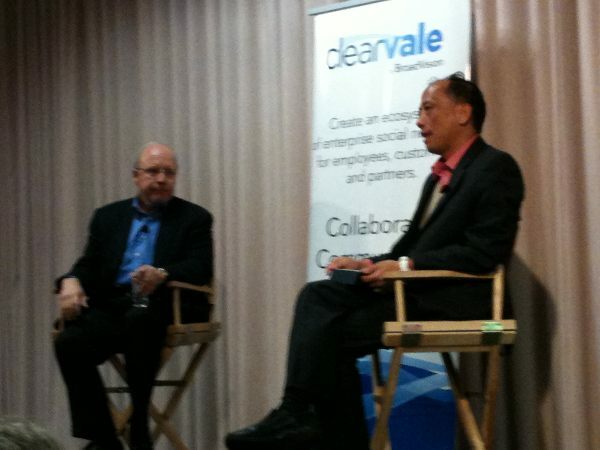 John Hagel III co-author of the book “The Power of Pull” was invited on stage for a discussion with Dr. Pehong Chen, CEO of BroadVision about how companies are (or are not) adopting of social technologies at the Enterprise 2.0 conference in Santa Clara yesterday. I am a big fan of him and his latest book, so I took notes on how he sees companies resolving these difficulties. JH: Most companies are still trying to figure enterprise 2.0 / social business technology out. They don’t know what it is about, nor how to adopt it. PC: What are some patterns that people use to get into it. JH: It is the same pattern that you have seen in the tech industry for a long time. Each wave of new technology comes into the enterprise under the radar. People start using it without permission. The broadest adoption of E2.0 within the enterprise is by teams with a 6 to 12 month timeline without permission of IT dept. They think “why not try this out” even though it is not officially sanctioned. It ends up being helpful to the team but it does not spread. When that team disbands you lose a lot of what they learned. Second form of adoptions is when an executive finds out about the new technology, and decides to deploy it. This is often good, but adoption process is a bit ad-hoc. A third pattern is becoming more prevalent: a check-the-box approach for cool things. Once it appears that all cool enterprises have to have a micro-blogging capability in the company, they get and deploy one. However these users are not always clear about why they are deploying it and what it is really useful for. PC: What is the right way to treat this? JH: Companies are most successful when they realize that tech by itself will not achieve anything. Instead, companies have to change the way that they work. Consider ERP systems, where the purpose was to eliminate people as much as possible, you could eliminate people and tell the remaining to use the software. This time, with E2.0, it is about individuals understanding how the technology works and how they benefit. Surveys of executives show that 2/3 of executives are resistant to the use of social technology. More than 70% of employees as well. Part of this is just the tendency to stick with the familiar. Others resist because think it is added work. PC: What is the role of change management? JH: Change management process is not a rational process. Instead, it is a political process. It is important to understand that it is about strengthening the allies, and neutralizing the enemies. The best way move forward is to show tangible improvement as quickly as possible. We came up with the notion of “metrics that matter”. Different metrics matter at different levels of the organization. Senior managers care and are motivated by financial measures. Mid-level managers are most focused on operating metrics. Customer churn rate, etc. Further down to the front line, there are performance metrics they are measured on a daily basis. To get the most impact, start with the overall financial pain points. If you focus on that, it may turn out the customer churn rate is identified as a problem that contributes to this. PC: Can you talk about examples of how to drill down through the metrics? JH: I have a recent example from an agency of the government that runs the bus service. They were interested in social software, and so they were thinking about creating a FaceBook page, and wanted advice on how to best leverage this. We were not convinced that this was the area of highest impact. We started analysis with the high level finance metrics: how much revenue, and how much cost. We found of that the single biggest cost component was maintenance of the buses, and it was growing. Why? The key operating metric was the lead time between when a bus broke down and when it got back on the road. It was taking longer to get them back on the road. Why? They were having a hard time finding the parts for their aging fleet of buses. Social software can make this an easier job: make missing parts visible. They had many locations, and when someone was in critical need for a particular part, they would post a message asking other for help. Others pitched in to help location and the result is they could more quickly find the part. That really changed the mindset of the implementers: these repairmen were the last people they ever through would use social software. In fact, it provided a real, immediate benefit, and they quickly adopted it. It sped up repairs, and made a real difference in costs. PC: The flip side of social network inside, is the social media outside. What about this divide? Is it artifical? JH: There are several reasons for this sharp distinction. For example the bus maintenance issue was purely internal. But there can be a lot of problems to integrate the external and internal. There are a lot of places you would like to do this, e.g. a call center. PC: When do companies get to the point that they start thinking about adoption more seriously? What do you recommend? JH: I am a contrarian. People talk about measuring the ROI. But the reality is that who ever controls the underlying assumptions can deliver whatever ROI they want. I have yet to see any enterprise that has gone back to look at the ROI to see if it materializes. It is better to focus on operating metrics. If your issue is lead time to get a bus on the road … you can track that on a daily basis. Then refine the approach. In many case studies on companies, very few had gone back and measured whether they actually achieved the projected success. PC: Are those focused on a specific set of goals? JH: Focus on specific parts of the org, specific people. There is a general pattern where social software can make the most difference: exception handling. I call this the shadow economy of the enterprise. Ask an executive “where do people spend their time?” 60-70% of time is spent on exceptions, and this generally not very visible. These are cases that have been thrown out of the automated system — and you have to resolve them quickly. Must find the right people engaged, the right data, resolve the issue quickly. In general, this work is all manual, and very inefficient. What is social good for? Finding the right people, finding the right information, and getting them to work together. Social software is a perfect fit for exception handling. In the bus example: the part was supposed to be there, but wasn’t, so that exception had to be handled. PC: My own personal example was a big customer in Japan had big problem, and the social platform took care of it. Before I woke up there was already 26 posts of people who had jumped in to take care of the situation. I didn’t have to chase a lot of email. Without the software, would have taken many days to find out. The system helps with serendipity and speed. JH: The other advantage, often underestimated, is making the invisible visible. Think about exceptions: because they are manually handled, there are no records. Executives can not tell you precisely how many exceptions they have. Some are truly some one-off cases. But there are also cases that are occurring with some frequency. As long as it is manual you will never find it. PC: What do you advise clients to do? What other traits will see more success and benefit from new paradigm? JH: Get the right senior sponsorship and quickly demonstrate results. There is a generational issue: the younger will adopt more rapidly. However, in the bus example the workers were in their 50s & 60s. PC: What about industry: retail, health care, high tech??? JH: We looked for patterns like that, but didn’t see any real patterns. For externally facing deployments we found that highly regulated industries have more obstacles to deployment. Otherwise, every where that has pain point and senior sponsorship. Q: when we hear that 2/3 within an organization are resistant, it seems the technology is in advance of what the organization wants. Is the resistance coming from those who contribute help, or more from those who are asking for help? JH: There is a big culture gap between the executives of the companies that I work with, and the vendors of the social software. The vendors talk about communities and relationships, and the executives don’t make the connection. The big issue in knowledge management is that the knowledge that is most valuable is in people’s heads. This means that the real job is about connecting people. Also, the collection of information needs to a fully integrated part of your job: if posting the records is a separate action that can be a problem. If you have to wait, the delay can be a problem. Needs to be integrated. If I can eliminate email, that can eliminate the burden. If the work style by nature is sharing, then everything is connected, and no additional work. But how do you change your behavior? Companies underestimate the value of a reputation system. Most don’t pay enough attention to this. 60-70% say that recognition is a key, above salary, for motivating people. Q: what is the impact of DeLoitte using community tools? It happens that professional service firms are made for social software. The work is project oriented. It is about finding the right person. We are now looking now at the analytics on top of social software. You can take patterns of interactions within Deloitte, and connect this to operating metrics. In one study interaction patterns, we found two kinds of interaction. One pattern was very tight interaction within small part of the organization. The other pattern was loose and more casual interactions but spread across more of the company. The latter pattern (loose but wide spread) has better tie in to performance metrics. In the case of the first pattern, the teams were TOO tightly knit. Q: Any sense of whether big organization or small is more likely to success with tight/less tight? The difference is less about size. With smaller companies, the primary value is connecting the company with the outside, because you already communicate well within the compan. In larger companies there are bigger problems with silos and fragmentation within the companies. Q: What other elements are necessary for the chaotic harmony? Consider the notion of passion in the workforce. The shift index is trying to measure long term changes. We tried to measure passion in the workplace. One common element is that participants are deeply passionate about what they are doing tended to be more associated with sustained improvement in performance. Passionate people are more connected. They instinctively reach out. A passionate employee is twice as connected. These passionate employees are more likely to connect with social software. Q: How is the culture inside Deloitte? What was before using social media, and what was the impact after that? Case study inside Deloitte? Growing adoption within Deloitte. Started in the way we said: early teams brought it in without IT involvement. But started to catch on an be used. Q: How do you see social technology fitting with BPM and business process? In any business process that is automated, there are always exceptions that fall out of the normal processing. As I mentioned before, social software is perfect for picking up those exceptions. Thus I see social software going hand in hand with BPM. What I found interesting about this talk was how John Hagel talks about social software in exactly the same way many of us have been talking about case management. He sees it as a way for people to get things done, by finding the right people, finding the right data, connecting, and arranging to complete activities. I am not surprised by this, but that he spend no time at all talking about Facebook and non-work aspects of social software. There is no question in his mind that social software is a productivity tool. Nobody in the audience suggested in any way that BPM is the same thing. How refreshing. The bus repair example brilliantly shows how solving a real need is more effective at gaining adoption than any amount of fanfare and persuasion. John continues to be an effective and important evangelist for the Big Shift in the way that companies get work done. This entry was posted in Social Business, Social Network and tagged Enterprise 2.0, ESS, SBS, social software. Bookmark the permalink. Many thanks for posting this – full of great insights from John Hagel. I hope you enjoyed the event. I did. Thanks for hosting. Excellent choice! If Hagel is so “edgy,” what’s he doing at Deloitte? Don’t tell me it’s to change that firm from within. That would be like a flea moving an ocean liner. In fact his work gets ZERO purchase with Deloitte clients. The Center for the Edge was brought on to sell work to clients–why else would Deloitte shell out millions? But the research conducted there has led to zero engagements. It’s all a way for everybody to feel like they’re progressive when in fact nothing changes. It’s all a way to further cement the status quo.